Untitled (Cerulean Blue Deep, Cerulean Blue, Cerulean Blue [imit]), is by it’s title, referring to the pigments it is painted with, connected to sky/heaven and is accord­ingly figurative by definition. I am interested in the ambiguity between painting as physical surface on the one hand and as structure in the physical space or landscape on the other hand, as well as how the specta­tor both physically and visually experiences these en­counters—how the image and the art space function like a stage for both physical and mental narratives. A space, and the image of a space. I think of a painting as a stage, a platform, a demarcated area, which provides the space and possibility for the telling of a story but where the events have not yet begun to unfold or are perhaps already over. It is a space for narrative—an im­age in the infinitive. First comes the surface: the canvas, the panel, the wall. Then the paint: pigments with special qualities; ma­terials which through their colors and contrasts create something else—an image. 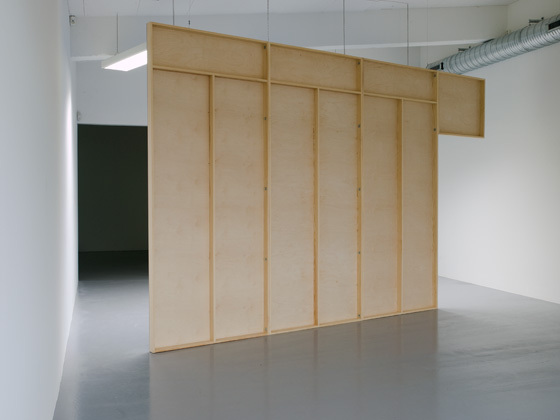 The image, which through its physicality takes up space in the room here and now, also has its own spatiality—the image space—with a physical depth corresponding to the thickness of the paint used, but which, regardless of whether it is a rep­resentation or not, contains a world unto itself. Some­where at this point, as the gaze makes its way through the millimeter-thick layers of paint on its way towards the image, the question arises: when is the image born? Or perhaps more aptly: when was the image born? Or if one argues that it in fact emerges over time: when does the image become an image? How much image does it take to make an image? It is in this ambiguity experi­enced before the painting that the gaze gets caught on the surface, or directly behind it, and turns around and searches inside the surface. One can see the spatial relationships in Untitled (Ce­rulean Blue Deep, Cerulean Blue, Cerulean Blue [imit]) as in a picture, with the space below the lamps in front of the painting being the foreground, the space behind the painting the background, and the painting/wall be­ing the middle ground, the stage of the drama; while at the same time it seems that the space in front of (and behind) is the stage (the stage for the viewer, for the body) and the painting/wall acts as foreground and background. 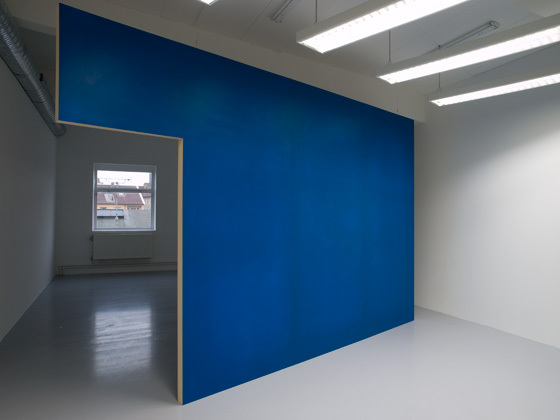 Besides being a painting – a flat image that “faces” frontally towards the entering viewer – Untitled (Ceru­lean Blue Deep, Cerulean Blue, Cerulean Blue [imit]) is also the image of a space (and now I don’t mean the space in the blue millimeter-thick surface but the im­age that is formed by association with a space, with the painting as the wall, and lamps as the ceiling). An im­age where the painted construction is a model and the lamps a metonymy. I enter the room and first encounter the picture/wall and then the connection with and the image of another (third) space is formed. Seen as a painting, what is the picture plane of Unti­tled (Cerulean Blue Deep, Cerulean Blue, Cerulean Blue [imit])—foreground, middle distance or background? The surface of the painting forms a whole or is a seg­ment of a bigger picture; a square that does not divide into different fields such as foreground, middle distance and background. It does, however, simultaneously move in all three of these planes since it is both physi­cally and mimetically a space. Physically it is built up in layers (with a certain thickness), the one over the other, but as a picture plane upon a picture plane in a two-di­mensional space—an image. The foreground is spread across the entire surface as is the background. Perhaps the foreground is so dense that the background is not visible. The picture is a representation of space, rather than place. But lacking any clear figuration I ask myself what the scale of the painting is. As the model of a wall it is on a scale of 1:1 but how large is the image? If the picture is imitating sky, how big is that segment? 3 x 5 cm or several square kilometers?